You should see our garage. It looks like some groovy Arabian Nights playroom. The walls-- adorned with purple sheets, on clearance from Fred Meyer. The floor-- covered with remnant carpet samples of varying sizes. At the far end sits my little blue tent, once used during Zach’s away-track meets to entertain Taylor, more recently a bedroom for Taylor during our latest remodel. We don’t seem to do remodels the normal way around here. They generally follow some sort of catastrophe: a dairy truck accident, a flood. (I’m keeping particular eye on matches these days.) Our latest mishap occurred this winter when someone forgot about a filling bathtub, apparently distracted by American Idol and that red-headed kid who sounds like Sinatra. Did you know that after a tub fills past the faucet level, it doesn’t make that water-rushing sound anymore? Anyway, when I first walked into the wet, I guessed nobody had let the dog out for a very, very long time. Then I noticed the stream flowing down the hall and the deep pool in the bathroom. Toy boats would have floated in there. The next morning our insurance company sent up a yellow truck from Albany with “Disaster Restorations” on the side. Our neighbors, recalling our peculiar history, loved it. Up popped the Pergo, pieced down the hall to the entry and kitchen. Out with the bathroom vinyl! Enter Larry, “the Sandman,” the Hardwood King of Oregon, the perfectionist who makes clients move out of their own houses. We retreated downstairs, happy for our day-light basement. Larry the Sandman made us leave the house entirely during the chemical sealant portion of his magic. Fortunately, my parents took us in. We had a sweet time with my folks; it was the best part of this ordeal. My old bedroom has the nicest guest bed in the house now and I got to sleep in that room for the first time since December 17, 1982, the night before our wedding. I slept much better there than that night. We’ve been back home for a while now. The kids requested we keep the garage space intact for the summer, so we did. 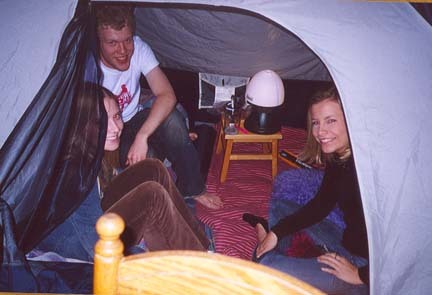 Whenever Zach has his group of friends over, the girls invariably ask to sit out in the tent with him. He likes that. A lot. We still await a new toilet, but in the meantime, we’ve been sprucing. Jim’s replaced light fixtures, faucets and sinks, and installed tile on the bathroom floor. I put in new hardware and painted and painted some more. 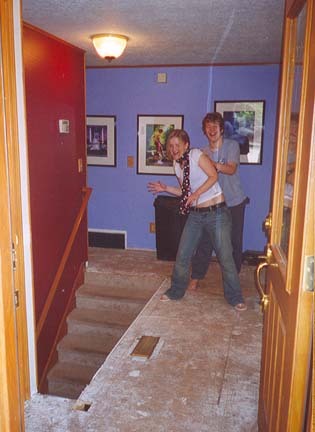 Fifteen years ago we built as much house as we could with a slim wallet and a vision of rich family life. Since then, we’ve upgraded, remodeled, and refined to the point of practically rebuilding the place, much of it by our own hand. Realtors say that houses with bland wall colors sell best. I think the only plain white walls in our house are in our closets. (Give me time.) James the pastelist and I veer dangerously further off the color charts each year. We could never sell like this. It is entirely too much us. So I guess we’re just stuck with staying in this place where our children have grown and will always know as their home, no matter where they go or what they do. It is a place full of our creativity and the sweat of our brow. The walls are thin but they are filled with laughter. We hope to never leave.